This page will include base metal objects including Candlesticks, Fireplace Accessories, Scales, Weights & Measures, Dining & Kitchen Accessories, Sculpture, and other Miscellaneous items. Commonly found base metal objects could be made of copper or its alloys of brass and bronze, the tin-based pewter alloy, iron or steel. The smaller items listed on this page can be shipped; larger pieces might have to be picked up by the purchaser. If a piece is marked Hold it has been reserved by a customer, if it is marked Paid we have received a check, and if it is marked Sold the transaction has been completed. To examine our latest additions please check out our New Listings. Please use the inventory number during correspondence to help us identify a particular item. 1555-49. Pair Antique French Brass Candlesticks in an 18th-century octagonal style with the shaft cast in halves and threaded into the domed and stepped shaped octagonal base; marked by Christofle et Cie of Paris, c.1844-1862. 9.25" high, 5.5" base diameter. The original silvering surface wery worn, missing bobeches, one nozzle with hole. $ 450. 1528-47. 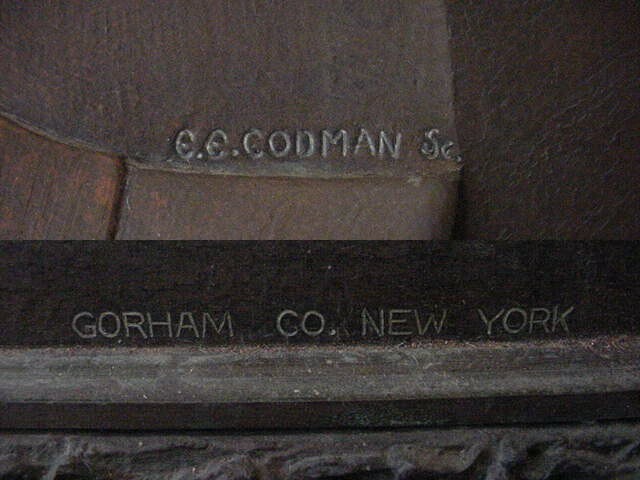 Pair American Copper Arts & Crafts Wall Scones with embossed arrowhead-form backplate, candleholder and wax catcher all with hammered finish; marked by the Roycraft Copper Shop of East Aurora NY, c.1910-1930. No mono. 8.0" high, 3.25" wide, 2.5" deep. $ 400. 1483-22. 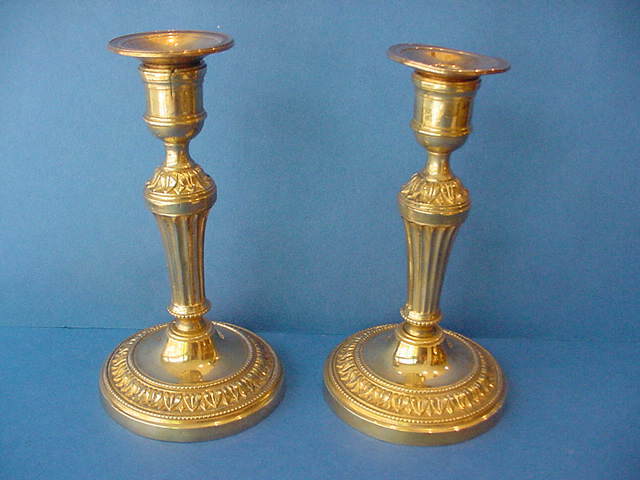 Pair Antique French Brass Candlesticks in a simplified 'Charles X' style with tapering shaft screwing into a molded domed base; unmarked c.1810-1830. No mono. 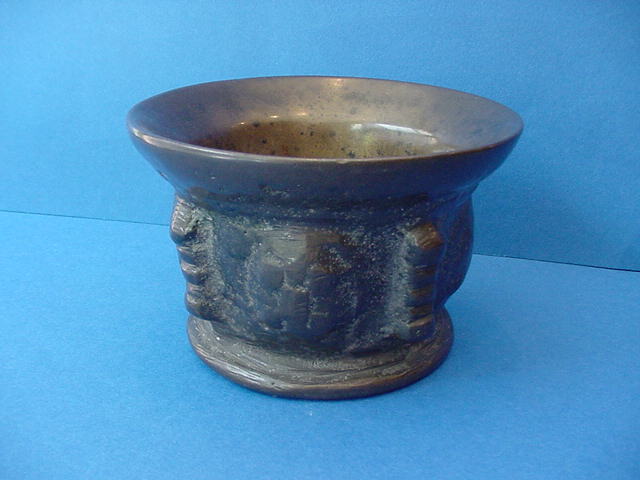 11.25" high, 4.75" base diameter. Missing bobeches. $ 375. 1557-44. Pair Antique French Brass Candlesticks in a simplified 'Charles X' style, the shaped cylindrical shaft cast in halves and screwing into a domed circular foot, the foot, shaft and thistle-form nozzle all with horizontal reeding; made by an unknown manufacturer, c.1810-1830. 11.0" high, 5.0" base diameter. Temains of original silvering under the base but worn off everywhere else, shaft now soldered into the base, and bobeches not original and non-matching. $ 275. 1494-30. Pair Antique German Pewter Candlesticks the fluted cylindrical shaft on a domed saucer base, the drip pan rim and shaft cast with foliate decoration; one marked [S.W.FEINZIN] possibly for the manufacturer and/or alloy quality, c.1825-1850. 8.0" high, 4.9" foot diameter, 2.38" nozle diameter. Some surface wear and dents to bases. $ 250. 1568-11. Antique American Brass Counter Scale supported by a stepped cylindrical shaft on a spreading foot, the flat balance beam tapering to the end steel-fitted pivot hinges at each end which each hold two heavy brass wire supports connected to the dished circular pans; marked by Frederick Meyers & Co. of Philadelphia PA, working, 1842-1853. This type of balance pan scale was probably used by a druggist. 29.25" high, 27.5" overall width, 17.0" balance beam length, 8.88" pan diameter, 5.62" foot diameter. 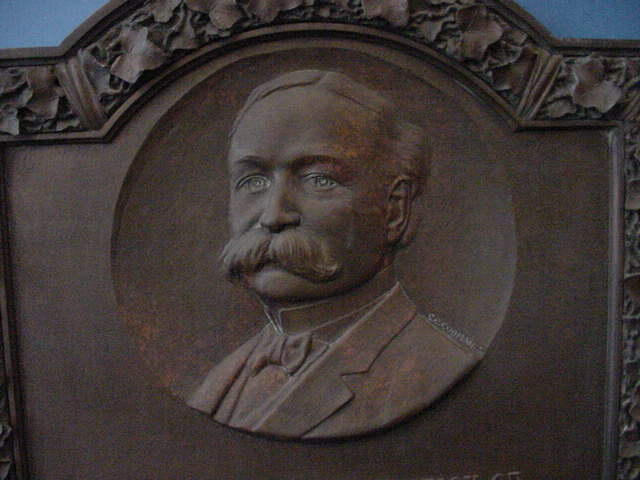 The junior partner Henry Troemner succeeded to the business in 1853 and within two decades had enlarged the business into the largest scale, weight & measure manufactury in the United States. $ 675. 1553-22. Antique French Pewter Small Tureen of conical form on short straight foot, both the body and the cover with hollow knob chased with geometric deocration on a matted surface; stamped "ETAINS D'ART AC" for Alexandre-Louis-Marie Charpentier (1856-1909) of Paris, c.1900-1905. 6.38" high overall, 3.75" high to lip, 10.25" long across handles, 8.12" lip diameter, 3.62" foot diameter. Some dings. $ 450. 1553-21. Antique Dutch Pewter Water Urn of baluster form on three scroll legs with turned wooden feet, the body, the high domed lid with turned wooden finial, and double scroll handle all painted with gilt floral decoration on a black background, cast brass spigot and valve; struck with an unrecognized maker's mark in the interior base, c.1775. 16.0" high, 9.5" long, 6.0" wide. Wear to surface decoration, one leg twisted. $ 450. 1493-02. 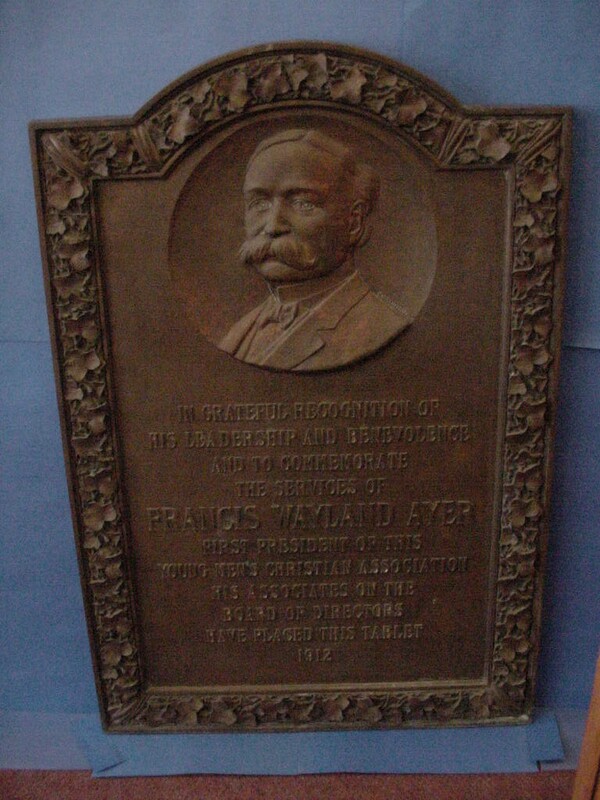 American Bronze Architectural Portrait Plaque of rectangular form with rounded top, cast with a portrait with presentation below, applied three dimensional ivy border; signed by Edwin E. Codman and cast at the Gorham Co. in New York NY. 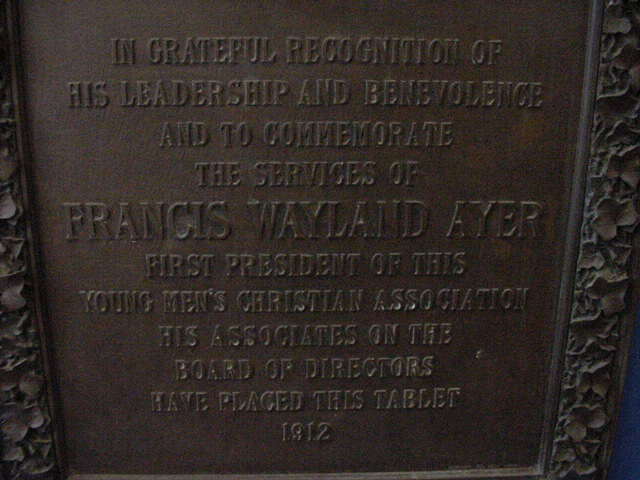 The cast inscription reads in part "IN GRATEFUL RECOGNITION...FRANCIS WAYLAND AYER FIRST PRESIDENT OF THIS YOUNG MEN'S CHRISTIAN ASSOCIATION...1912". 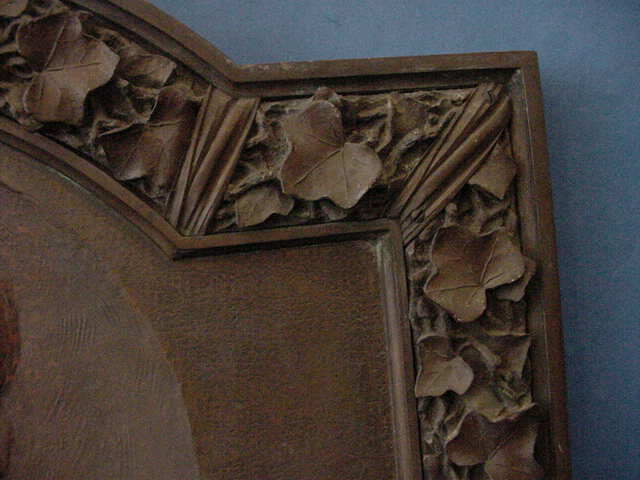 36" high, 24¼" wide, 2" wide at border. This is extremely heavy (about 80-85 pounds); we could deliver within a reasonable distance but would prefer not to ship. (If shipped FedEx Ground we estimate $100-150 cost depending on distance) $ 1,000. 1462-37. Pair American Arts & Crafts Brass Bookends with each end consisting of three pieces of scrolling square stock mounted on a shaped and hammered flat bed; made by the Roycrofters of East Aurora NY, c.1900-1930. No mono. 5.12" high, 4.05" long, 5.25" deep. $ 280. 1552-59. 4 Antique American Brass Tiebacks, the pressed circular dished tieback with floral, foliate and shell decoration mounted on a tinned back fitted to a turned brass shaft ending in a screw; unmarked 19th century. 4.25" diameter, 5.5" long + 1.5" screw. $ 300.